Marine electrical generators are available in two types, gasoline and diesel. Gasoline generators tend to be less expensive to buy than the diesel variety, but they cost more to operate. The most important issue in deciding what generator to buy is specifying generating capacity. Marine electrical generators bring a boat's creature comforts to life. Choosing the best one to meet your needs is involved, but not complicated. Here are the basics. Marine electrical generators are either gas or diesel. Just like main propulsion engines, diesel marine electrical generators cost more than their gasoline counterparts, but are significantly less expensive to operate. Conversely, gas marine electrical generators are cheaper to buy, but more expensive to operate. Gas marine electrical generators require overhaul sooner than diesel ones, but once the longer-living diesel finally gives up the ghost, its repairs are pricier. If it seems gas vs. diesel is merely a dollars-and-cents decision, however, that's just not true. With marine electrical generators, choice of fuel is a moot point. Whatever hydrocarbon flows to the main power plant is the fuel your genset is destined to burn. Never, absolutely never, make the mistake of installing a gasoline genset with diesel main power, or vice versa. If you do, as sure as the sea is salt, somebody, somewhere will inadvertently mix up the two fuels. Either the main propulsion engine or the genset will swallow a dose of its worst nightmare and quit running. In the extreme, you risk explosion and fire. Besides the specter of maritime catastrophe, remaining faithful to a single fuel makes it simpler to plumb the fuel line. The most crucial decision you will make in choosing a genset is specifying generating capacity. marine electrical generators are rated by output. Where a small unit might generate 2kW of electricity, a larger one will produce 5, 10 or even 20 kW. Obviously, how big a genset you need depends on how much electricity is consumed. To determine that number, list all of the boat's AC appliances along with each one's watt rating. In case you're unfamiliar with watt ratings, the number simply tells how much current an appliance draws. The rating is located either on a UL plate riveted to the appliance, or stamped on the side, back or bottom. If you can't find the watt rating, peruse the owner's manual. We've provided a list of common galley and salon appliances along with representative watt ratings in the chart below. Don't consider these numbers gospel; they're merely presented to give you an idea of how much electricity certain creature comforts draw. Determining the current draw of the refrigerator and/or air conditioner is slightly more complicated because refrigerators and air-conditioner compressor motors draw extra wattage when starting up. Once up to speed, the current load falls. You need the start-up rating. Total the watt ratings of all the AC-powered components on your boat. A boat's total current draw is expressed in kilowatts (kW), a term that means one thousand watts of electricity. As a rule of thumb, select a genset rated from 10 to 25 percent greater than the boat's average draw. In other words, if your totals add up to a load of 1,500 watts, then 2kW worth of genset is just about right. Extra capacity allows you room for future appliances, yet doesn't leave the engine loafing. With marine electrical generators, bigger is not better. Excess generating capacity wastes fuel, and squanders purchase dollars. Another consideration is peace and quiet. The bigger the engine, the more noise and vibration. But far and away the premier reason to correctly size a genset is longevity. Without a full load shouldered against its crankshaft, a genset engine can wear out prematurely. For this reason, marine electrical generators should be operated at about 50 to 75 percent of their rated capacity. If all the onboard electrical appliances total 5 to 8 kW, that doesn't necessarily mean you need a 10 kW genset. Do you feel, as I do, that admiralty law does not require every light, stereo, and VCR be powered up at the same time? Do you mercilessly hound the crew to turn off the lights, and ration electricity? Or are you one of those skippers who prefer every single appliance be on at once? Either way, size your genset according to how you expect to consume electricity. Depending on how much room is available for installation, some boaters will install two different-sized marine electrical generators. The smaller unit runs during light loads, the larger during peak electrical consumption. 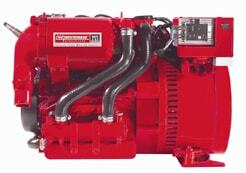 Besides kW rating, another genset-sizing consideration is available space. Obviously there must be adequate room for installation and maintenance. The quality of the installation itself is also of paramount importance. If the job is botched, raw water could siphon back into the engine's cylinders, drowning it. Improperly-routed exhaust can kill passengers with carbon monoxide poisoning. Fumbling the layout of the raw-water cooling lines can cause overheating and result in a blackout. Cobbled electrical connections can electrocute you. Here's a tip. Insure that the genset's fuel-tank dip-tube reach is shallower than the propulsion engine. That way the genset won't run the tanks dry, leaving you stranded. As for portable marine electrical generators, they have no place on board a boat. When cranked up below decks, they are veritable time bombs. The dangers here include spilled fuel, fire, carbon monoxide and electrocution hazard. If you want creature comforts on board your boat, permanently install a marine genset. As for maintenance, marine electrical generators require the same level of attention as the boat's main propulsion. Drain accumulated water from the fuel/water separators at the start of each day. Change genset fuel and oil filters as per the owner's manual, or about every 50 to 60 hours' running time. Insure the lubricant's specifications meet the genset manufacturer's recommendations. Use marine-spec lube; automotive oils do not adequately protect cylinder walls against corrosion. Periodically check zinc rods making certain they're capable of fighting corrosion, and be sure that the raw-water impeller is undamaged. Once a year, service the spark plugs and inspect the genset's electrical connections for corrosion.